Yours truly is one of the 1.7 million subscribers who was not able to receive Globe Telecom's 4438 reveal on April 4, as advertised. This was brought about by the extremely high traffic generated by subscriber transactions with the 4438 service number on Sunday, which also contributed to the reaching of time cut-off set by the National Telecommunications Commission for Globe's text blasting. The SMS finally arrived at 11:59AM today. With the help of Twitter, Internet, Facebook and other blogs, I didn't have to wait for the SMS to know what the program is all about. Apparently, the 4438 reveal is all about attracting new customers and keeping current subscribers through its My Rewards, My Globe point-system rewards program. The rewards program is open to all postpaid and prepaid subscribers, wherein everyone using Globe is already part of this permanent program. Unlike promos that can be suspended at any time the telecom company wants to, this program is seen to last for a lifetime. By texting REWARDS to 4438, you'd receive an infotext about the keywords you may send to get further details about your current points, freebies, and discounts. For both prepaid and postpaid subscribers, one can earn points as long as you keep being a subscriber - the longer you're a subscriber, the more points you earn. It is not clear though how many points one can earn in a certain span of time. Additional points can be earned by prepaid subscribers whenever you reload your account. As a matter of fact, you don't need to spend anything. By just being a Globe subscriber, you can already get discounts to your favorite establishments like 15% off at The Tshirt Project, 10% off at Folded & Hung, free drink upsize from Coffee Bean and Tea Leaf and KFC, plus a whole lot more! On the other hand, the points you'll earn allow you to exchange them for Globe products (IDDSuki, UnliTxt, SuperUnli), Ayala/Centerstage/Enchanted Kingdom/Manila Ocean Park entrance passes, PAL Miles, Gift Certificates, and Gadgets (Canon digicam, mobile phones, etc). With the highest number of points at 43,300 among all rewards, you can already redeem it for Los Angeles PAL Miles. I received this notification this morning and I activated my membership... I don't really know what it's about until I read you post. 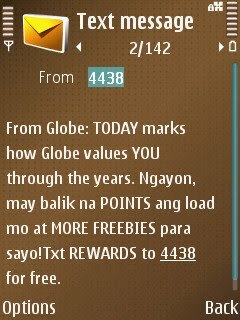 Anyways, I was very disappointed when GLOBE discontinued their immortal program. I'm not a heavy SMS user, and that program has saved me a lot of moolah for a long time. Now that its gone, I don't have a choice but to subscribe to either sulitxt or unlitxt everytime I'm in the mood for some serious texting. @caloy, glad that this blogpost has helped you understand the rewards program. Although IMMORTAL 10 has been discontinued, IMMORTAL 15 is still available. With that, you get 50 texts + 5 mins call. :) I always use that as well. I didn't know that. Someone told me a couple of months ago that immortal10 has been discontinued, and I thought that was it. I never realize that they still offer immortal 15. Wow, thanks dude! Great post Glenn! Will start tinkering more with this awards program, try the discounts, and blog about the experience. Cheers!